Beach balcony has plenty of seating for relaxing, eating and grilling. Spacious living room has large flat screen tv, ample seating space and gorgeous views. Dining area has marvelous views of the Bay and seating for 6. Kitchen is stocked with all you should need to create a culinary feast. Breakfast bar in kitchen has seating for 3. Master Bedroom has King size bed, beach balcony access and sunset views. 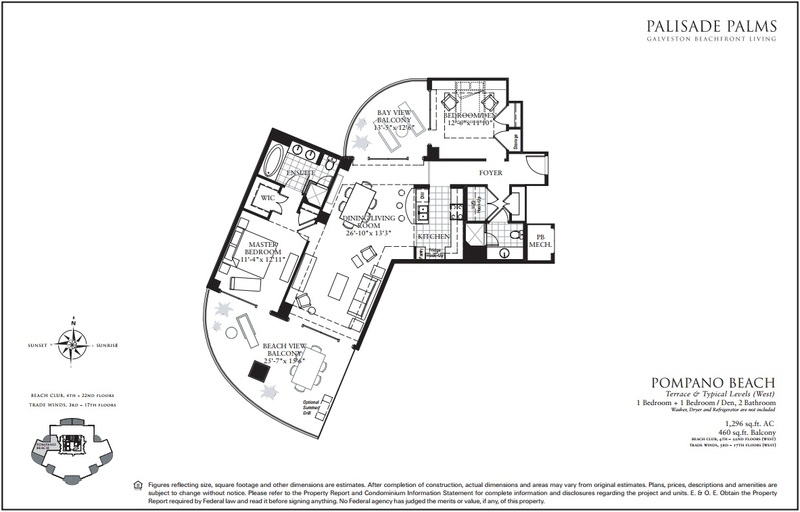 Master en suite bath has dual sinks, walk-in shower and 6ft bathtub. Second Bedroom has Bay balcony access and queen size bed. Second Bathroom has ample counter top space and a walk-in shower. Bay side balcony, enjoy watching the ships, ferries and sailboats. 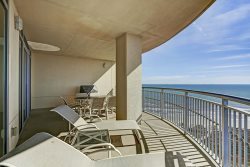 The views are superb from this comfortable 16th floor luxury condo! You will not want to leave. Excellent views of the entire coastline to be enjoyed while dining on the large beach balcony equipped with a stainless grill. The living area, with floor to ceiling windows, leads out to one of two balconies. Fully-furnished in neutral colors, the living area includes a sleeper sofa for additional guests. The dining table seats six and is located right off of kitchen; breakfast bar seats three. The fully-equipped kitchen has stainless appliances, lots of storage, and a bonus beverage bar with glasses provided for entertaining. Take in the spectacular view of the bayside from the second balcony with access to the second bedroom. The master suite is furnished with a king bed and en suite bathroom with walk-in shower, separate tub, and double sinks plus access to the beach side balcony. The second bedroom comes with a queen bed and access to the bay side balcony. The second bath has a walk-in shower. Enjoy a day at the beach and come home to this relaxing condo! Every member of TCR staff with whom we've had dealings has been 100% professional, courteous, and focused on making our stay as guests the best it can be. In particular, Cathy Duiguid stands out as a team member who did not rest until she had resolved our concerns in October of 2018. For us, Palisade Palms Trade Winds tower is the only place to stay in Galveston. Every aspect of the property is maintained with an eye to luxury without being gaudy or overbearing. The amenities are top-tier and geared toward providing the guest, as well as the resident, with an exceptional, one-of-a-kind experience away from the noisy hustle and bustle of certain areas along Seawall Boulevard while still being accessible to the island's attractions, restaurants, and beaches. Renting was easy and the staff at the desk were always very friendly and accomodating. We worked with Sommer for our renting and she was very helpful and made sure all our request were fulfilled. Palisade Palms is a wonderful place to have a quiet vacation. Common areas are beautifully decorated and welcoming. the pool area is very nice and gives everyone an opportunity to have shade or full sun as they wish. A quick walk on the boardwalk brought us the the beach for our daily walks. The concierge staff was also extremely friendly and helpful from the moment I walked in until I left! Unfortunately it rained/ thunder stormed the week I was there but I was still able to enjoy both balconies views, grill, game room, ping-pong room, and the coffee bar every morning! I also was able to meet many of the full-time residence, extremely friendly and welcomed me with open arms to their activities! No issues. Everything done thru email. Everyone was great, from the initial booking of 4 condos, to checkin, to every single time we walked through the lobby, to checkout. We were always greeted with a wave and a smile. Overall a great experience! The staff was great, the grounds were very well maintained, pool was perfect for our family of all ages. Couldn't have asked for more! This was our 5th year to rent the condo. We have thoroughly enjoyed the stay each year. It is well stocked, well maintained and a beautiful location. We will look forward to renting again next year. Everything was as described! The Condo was outstanding, clean and everything worked as described. Great place. Very comfortable. Had a great view of the fireworks from the Gulf balcony. Definitely recommend this unit. Am an owner at this facility.